In the 1640s and 1650s a number of cast-iron ledgers were being produced, mainly in the Broseley area of Shropshire. They were surprisingly robust and a large number of such items survive, in a remarkable pristine condition, both within churches and in churchyards. However, it was not until the mid-eighteenth century that the iron-master became more innovative, and it was John Wilkinson (1728-1808), a Cumbrian industrialist who became a partner in the Bersham ironworks at Broseley in 1757, who introduced a variety of cast-iron goods, including churchyard monuments. Wilkinson, who was the instigator of the first iron bridge at Telford, acquired the nickname of “Iron-Mad” Wilkinson and when he died in 1808 he was deposited in three iron coffins beneath a huge iron obelisk on his estate at Lindale-in-Cartmel, Cumbria. In the churchyard at Madeley, Shropshire (which formerly included Coalbrookdale and Ironbridge) are a number of large cast-iron monuments, the earliest of which is a tomb-chest to the Rev’d Jean de la Flechère (d.1785), the German vicar of Madeley. In the same churchyard is an exceptionally elegant cast-iron monument to the ironmaster William Baldwin (d.1822), taking the form of a large pedestal with corner fluted columns, an entablature with palmette cresting and a small sarcophagus above, the whole surrounded by tall, slim railings. Ten miles to the east of Madeley is the village of Pontesbury. 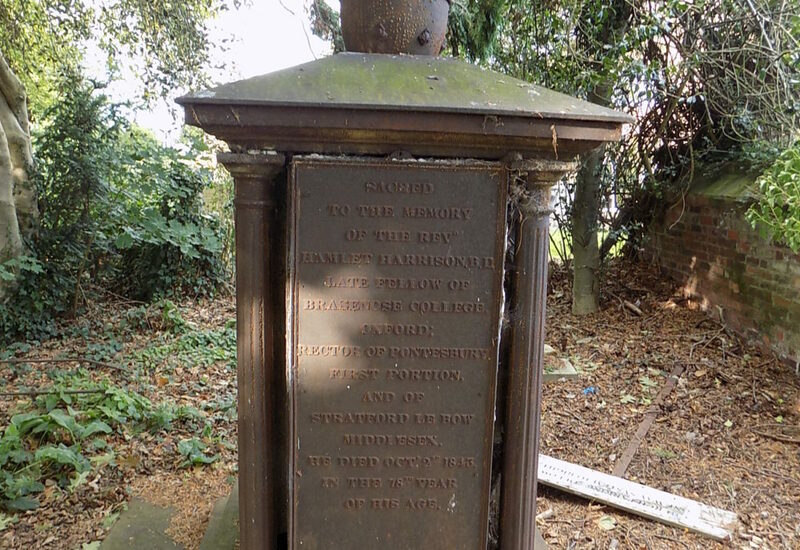 Its churchyard also has a cast-iron monument from the Baldwin foundry, to the Rev’d Hamlet Jones (d.1843). Unfortunately its iron railings have long gone, but the tall pedestal, a variant of that at Madeley to William Baldwin, supports an enormous flaming urn. Hamlet Harrison (b.1765) was a Lancashire man. He attended Brasenose College, Oxford (BD and MA) and was ordained deacon in May 1790 and priest in December of the same year. He was made perpetual curate of Shareshill, Staffordshire on 22 January 1793, the same day that he was also appointed schoolmaster at Brewood Free School. Holding livings in plurality was not unusual at that time and on 3 November 1809 he was presented by Brasenose College as rector of Stratford-le-Bow, Middlesex. In December of the same year the family living of Pontesbury, Shropshire became available and Hamlet was presented by his father, Joseph Hamilton of Park Stile, Walton-on-the-Hill, Lancashire as rector. In February 1811 he resigned the living of Shareshill whilst keeping those of Stratford-le-Bow and Pontesbury. Eventually resigning the latter in April 1824. He remained rector of Stratford-le-Bow until his death on 2 October 1843 and was buried in the churchyard at Pontesbury.